Signposts give Luton, Dunstable and Houghton Regis a Great British Spring Clean Published: 17:26 Tuesday 27 March 2018 Share this article Homeless charity Signposts supported Luton Council to give the town a Great British Spring Clean. 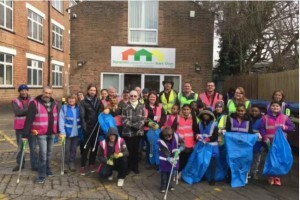 Over five days from March 21, schools, community groups, partners, local business, staff from local authorities and members of the public cleaned up 14 different areas. The areas chosen were North, South, East, West and Central Luton, Dunstable and Houghton Regis. Chantry Primary Academy, Whitefield Primary School, Southfields Primary School, Luton Airport Squadron 10F Air Training Corps and The Ahmadiyya Muslim Youth all volunteered to help with the big clean. Signposts Head of Community Partnerships and Innovation, Phyl Rainey, said: “We are thrilled to see this event growing year on year with so many volunteers from all over the town joining this fantastic event. “It was a great example of what can be achieved when different communities come together.” The event was launched by councillor Aslam Khan in Bury Park with a number of local councillors getting stuck in and joining the 337 volunteers who picked up 600 bags of rubbish and numerous other items over the five days. Luton councillor Rachel Hopkins, Gill Peck, Signposts service manager for community partnerships and the charity’s chair of trustees, Carole VanSchagen, closed the event and thanked the volunteers for their amazing contribution to our town. Signposts provide supported hostel accommodation for homeless people, offering them the opportunity to get involved in local community projects.